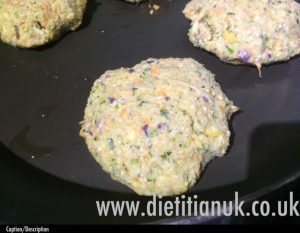 I’m forever loving the idea of veggie burgers but am often disappointed by the result. You know what I mean… they fall apart or just look disappointing. In the back of my brain I have this memory of the burgers I used to eat when I was vegetarian as a teenager. In my head they were delicious, not homemade, but delicious and that is one of my benchmarks. My other benchmark is the burger they make in a cafe we sometimes end up at – a portabello mushroom with halloumi cheese and spinach. Just the most perfect combo. Here is the recipe. It’s a great way to get your veggies in. I’ve worked it out as being 1 portion of vegetables per burger, if you make them large. This recipe made 8 and I served 2 per adult, 1 per child, but my 5 year old and husband came back for seconds! Use a food processor to grate the veggies. Now add the chickpeas and process to a thick paste. Add the oats, egg, herbs and spices for a quick blast in the food processor. Use your hands to shape into patties. Heat 1 tbsp oil in a pan and cook them for a few minutes each side. I pressed them down in the pan to make them thinner and a better shape. Transfer to the oven for 10-15 minutes at gas mark 5. Serve with homemade potato wedges and a side salad. You know those moments when you have a craving for chocolate? For me it is usually mid afternoon, that lull part of the day. Or just before teaching a class, when I need a pick-me-up and energy boost. So I created these beauties to help me, as I’m kind I thought I would share 😉 Now who wants one? Note: these are delicious and easy to make, but you do get messy hands! Packed with nuts and dried fruit I find these great to grab 1 of as I’m on my way to teach a class. My children like them as part of their pudding calling them “chocolate balls”. Shall I tell her they don’t actually have chocolate in them? 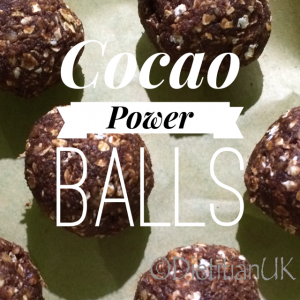 A power packed healthy treat with that chocolatey hit. Blitz the nuts in a coffee grinder or chop them into small pieces with a sharp knife. I use the nuts and seeds grinder on my Kenwood Chef. I used a mixed of walnuts, hazelnuts and cashews. Remove the nuts and place in a bowl. Now blitz up or finely chop the dates, add a splash of water if needed to help as they are sticky! Add to the nuts and mix in the cocao and a little water if needed to help it all bind. You can pop it in a stand mixer at this point and save your arms. Roll into small balls and you are done! 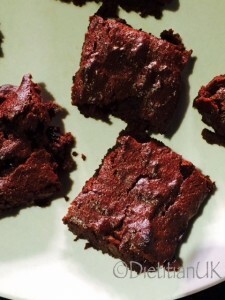 Lentil and Date Chocolate Brownies. A revelation! It’s not often I get inspired to make brownies. Don’t get me wrong, I love a brownie, but they generally aren’t the healthiest thing you can bake and once you make a batch you have to eat them, right? So it’s usually flapjack in my cake tin. However this week Miss K brought home a lentil brownie recipe in her bag from school and it intrigued me. 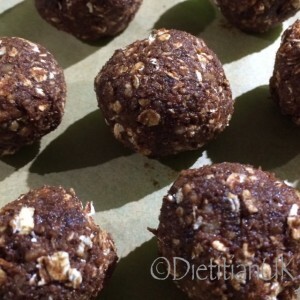 Lentil in a brownie? Surely not. I’ve adapted the recipe slightly to lower the sugar and next time I would definitely add in pecans. You can’t beat a pecan in a brownie. These were a hands down winner. Easy to make (as long as you have lentils already cooked or cook them earlier in the day) and they baked whilst we ate dinner. I gave one to my hubby, he looked at me suspiciously and took a bite, then with a surprised voice told me they were really good. My poor family have to try a lot of dud baking as well as the good bits! None of my children or husband even noticed the lentils. I had a faint taste of them, but I had made them so was probably a bit sensitive to the taste. 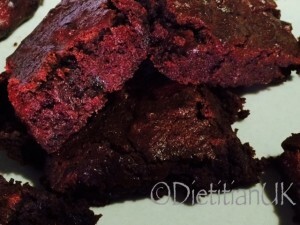 A great way to lower the glycaemic index and make a higher protein version of a chocolate brownie. Cook the lentils or use tinned. Chop the dates into small pieces. Line a baking tray and spread the mixture in, you want it fairly thick. Bake at Gask Mark 5 for 20 minutes until it feels gently set. Leave to cool, cut and eat! Starting School:Tuna, Avocado and Quinoa salad. This week Miss K has started school! Oh My Days, how did she get to be so grown up? We’ve spent a couple of weeks getting all the uniform ready and talking through what happens when you go to school, preparing as best we can. She went from extreme excitement, to being anxious, full of tears and needing a lot of cuddles, back to being excited. Thankfully so far the first week has gone well. A few tears but nothing major. I pretty much love quinoa. 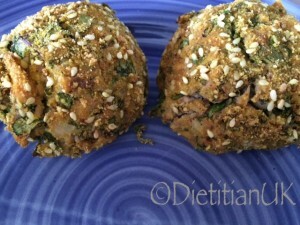 It’s wheat free, it’s got a great texture and it is high protein which makes it filling. So this lunch is a perfect one if you have a busy afternoon and need fuel to keep you going. Both hubby and I had lunch and literally sat there saying “Wow that was delicious and filling”. I ate it before teaching my many Pilates classes and was full until teatime (which is a small miracle). I cooked the quinoa at breakfast time whilst we ate our cereal and left it with the lid on until after the school run. It was then a doddle to chop up all the veggies, mix in and leave in the fridge until lunch. 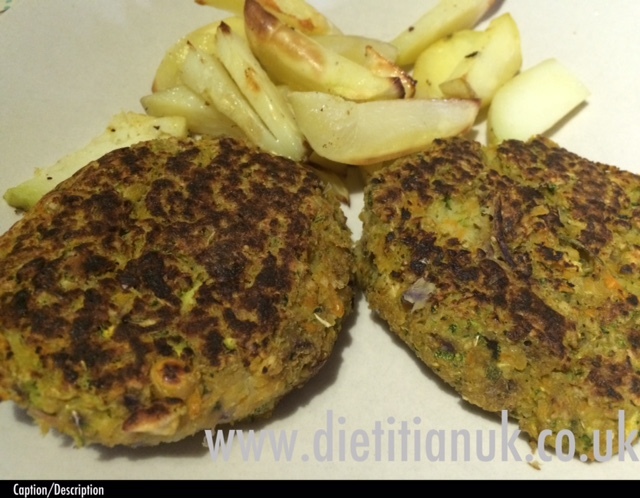 A filling, satisfying and tasty lunch for home or lunchboxes. Cook the quinoa in the water, simmer for 10 minutes and then leave to steam and cool with the lid on the pan. Chop the veggies up and mix into the cooled quinoa. Flake and add in the tuna. Mix the lemon juice and olive oil together and pour over the quinoa salad. Toss gently and serve on a bed of salad leaves. 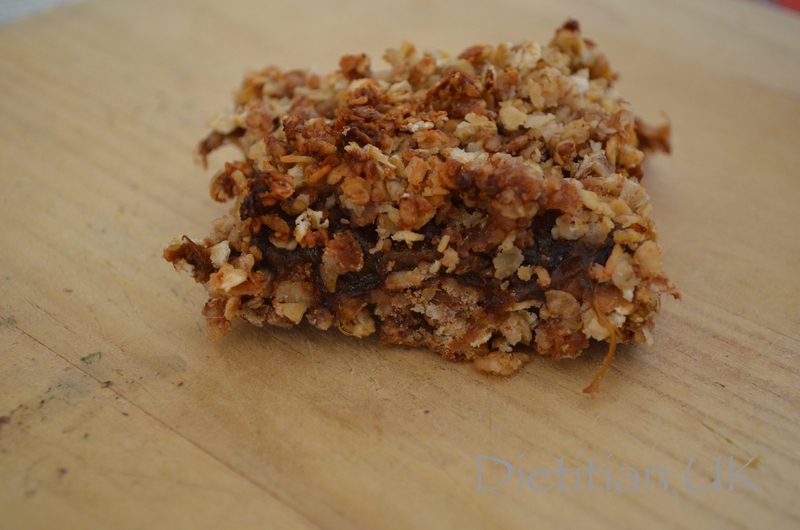 Banana, Peanut Butter and Chocolate Chip Flapjack (WF, GF, DF). It’s been a rainy summers week, so I felt the need to pimp up my own flapjack recipe to cheer us up. 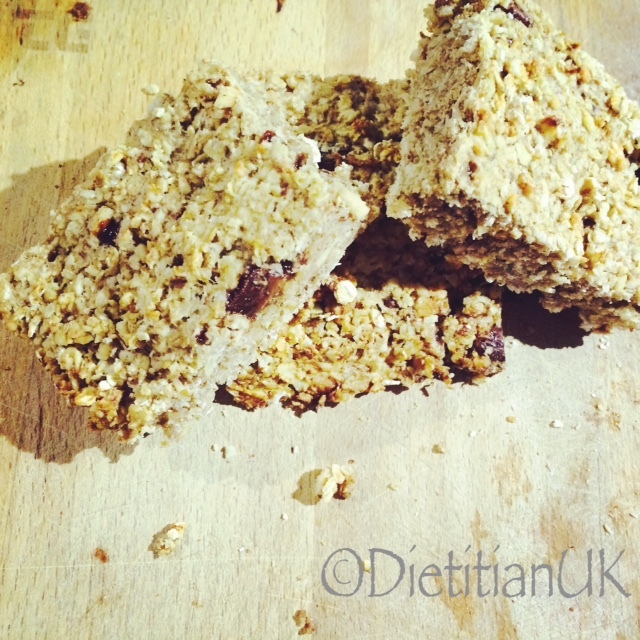 It’s a healthier take on a full fat, full syrup flapjack, perfect for a cuppa on a rainy day. What is even better is that I used peanut butter in it so my hubby won’t touch it 😉 I love using peanut butter in baking as it is lower in saturated fats, higher in the heart healthier monounsaturates and it also adds protein to help with satiety. The oats provide low glycaemic index carbs which can help stabilise blood sugars so also helping to keep you fuller for longer. It should provide for a healthy snack that will tide you over until your next meal. 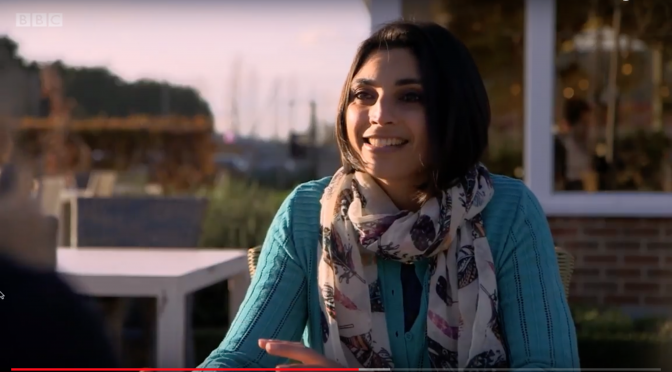 Recipe creation for me provides an outlet for creativity and is almost a form of therapy as I switch off from “work” and get inspired by what is around me. It’s actually something I sometimes recommend to eating disorder clients, but they don’t have to eat it unless they want to. Often they love looking at recipes, love creating things and so being given the green light to go ahead and make things but not have to eat them can be quite releasing. So here is my latest flapjack. It’s a keeper. It is also wheat free, gluten free (if you use gluten free oats) and can be made dairy free if you use the right chocolate. GENIUS. Mix it all together by hand or food mixer. Grease and line a baking tray. Spread it into the baking tray, so it is about 2cm thick. Bake at Gas Mark 5 for 25-30 minutes. Rhubarb Crumble Squares (GF, DF, WF). We’ve just had a wonderful week away in France, where all the food was cooked for us. I love being cooked for. One of the days we had rhubarb crumble. Rhubarb is one of those fruits that I adore but don’t cook very often as the rest of the family are not as keen on it as I am. I love the tart flavour and the way it perfectly compliments custard, another of my favourite foods! On coming back home we have all felt pretty exhausted. Such is the joy of a holiday and travelling with small children (one of whom did not sleep at all well all week). However after a week out of the kitchen and a week of no flapjack, my creative side was itching to get going. So instead of sitting on the sofa and dozing, like I should have done, I remembered a neglected bag of rhubarb in my freezer. 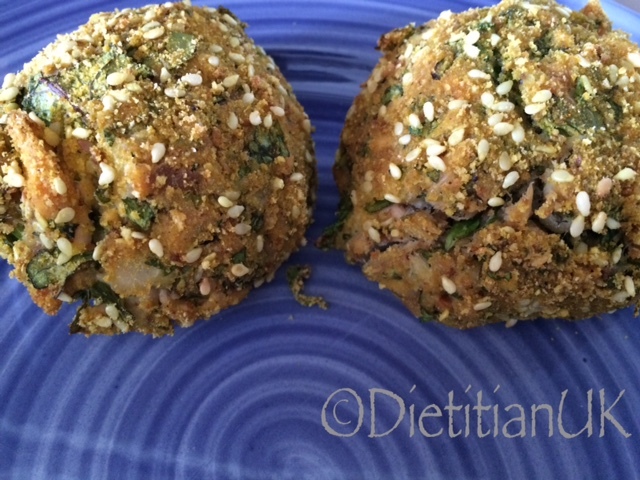 It was literally shouting out to me cooked up into an oaty, crunchy, crispsy, chewy delight. 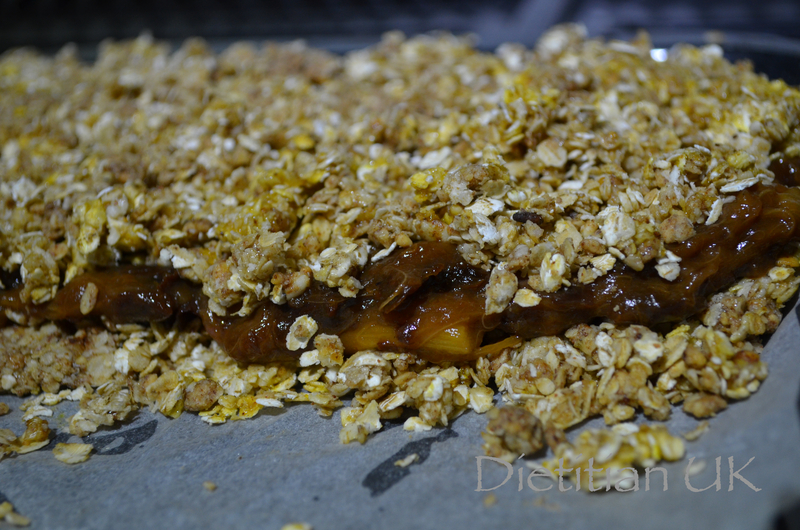 I took inspiration from crumble, a rhubarb crisp recipe that came to me from childhood and my beloved flapjack. This isn’t any ordinary flapjack. 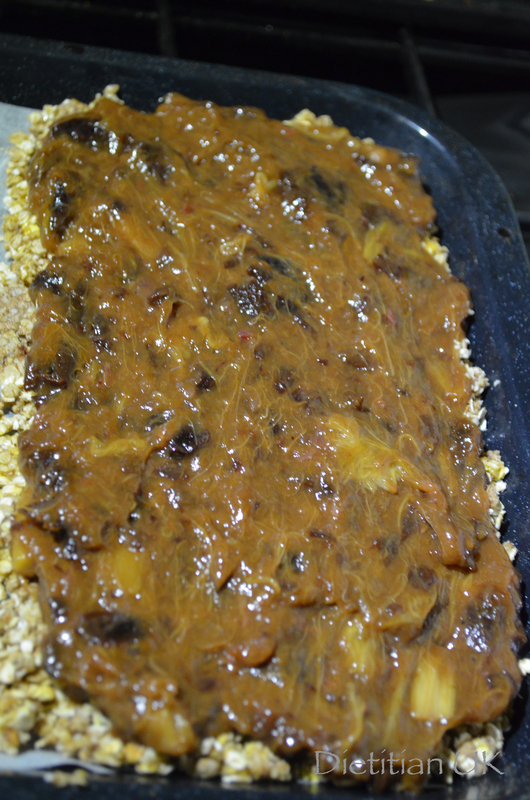 This is rhubarb cooked to a jam consistency, layered ontop of a soft oaty base, topped with crispy oaty bits. I’ll admit I was unsure about the peanut butter, but you know what? It works! Both my kids are instant fans, rhubarb is back on the menu! The rhubarb layer goes on. Naturally sweetened rhubarb on a soft oaty base with a crunchy oat crumble on top. No added sugars. Plenty of natural sweetness and wholegrain goodness. Place the rhubarb in a pan over a medium heat. Let it start to release its juices and cook. Meanwhile finely chop the dates and add to the pan with 100ml water. Mix the cornflour with the 2 tbsp water and mix in. Allow it to all simmer away for 10 minutes, stirring frequently so the rhubarb breaks down and it all become a sort of jam. Whilst that cooks mix the oats with the peanut butter and the egg. Spread just over half of the layer on the base of a flapjack pan. Top with the rhubarb jam. Crumble the rest of the oat mixture over the top. Bake in the oven at Gas Mark 5 for 25-30 minutes. Apple Crisps, perfect for a slow autumn day. We recently acquired a whole heap of apples, I am just one of those people who cannot say no to free food, especially when it is fresh fruit/vegetables. So this weekend I’m working my way througb trying out a few apple recipes, there may be a bit of apple overload on my bog. Apologies. It’s good to be seasonal though isn’t it. I love Pinterest for ideas and inspiration. Today a quick apple search reminded me of apple crisps which I tried to make once before and was very disappointed. With so many apples to hand and some time to read through a number of different techniques I decided to revisit the idea. This time I was successful. So successful that my first batch were greedily devoured by the toddler very quickly and I have to make more. If you have a few hours at home and its a bit cold, why not try this out as it will warm up the kitchen and make your house smell delicious too. I’ve now got a pot of these ready for snacks throughout the week. 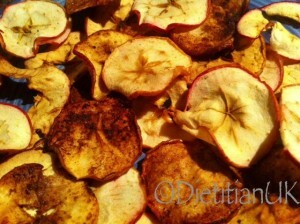 Healthy apple crisps, easy to make but take time to cook. Slice the apples horizontally as thinly as possible (going through the core so you get a pretty star shape). Keep the skin on and do not worry about coring the apples first. Line a baking tray with parchment and lightly grease it. Mix the lemon juice and water together and place the apple slices in the mixture. Remove, shake off excess water and place on the baking trays. Bake the apple slices for about 3 hours, checking and turning every 30 minutes. For chewy apple slices remove them slightly earlier, if you leave them longer they will crisp up. This week my Archchi came to visit. This is my Sri-lankan grandmother, fondly known to the whole family as Archchi (granny in Singhala). She lives in London and has the greenest fingers of anyone I know. Years ago she had 2 allotments, now its just her garden that produces mainly vegetables, lots of vegetables. From her recent visit I ended up with 3kg cherry tomatoes, 3 red cabbages, a large carrier bag full of apples and a pile of greens plus coriander. Lush. The cherry tomatoes were at the stage of needing to be eaten so I decided to roast them with garlic, rosemary and balsamic vinegar. Top this off with sausages and you have a super simple, yet tasty meal. Went down very well with the family and I got the comments of “succulent, tasty and satisfying” from the husband, followed but mmmmmm from the toddler. Praise indeed. I used gluten free sausages for ours and served it with rice but you could serve it with pasta, polenta or mashed potato. 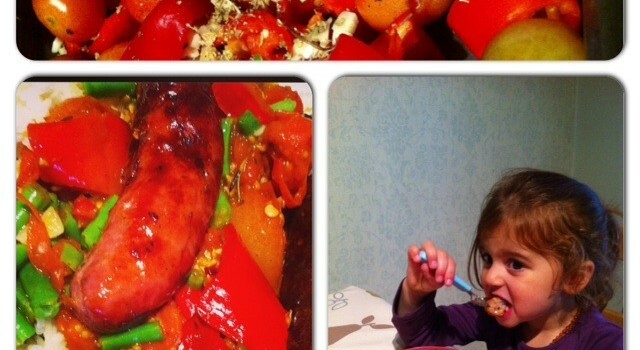 A simple to make but super tasty one tray sausage and tomato bake. 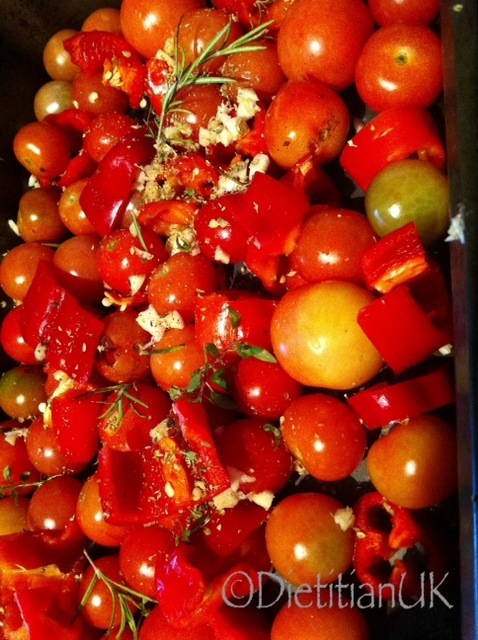 Place the tomatoes in a baking tray, in a single layer. Chop the garlic finely and add to the tomatoe. Add a good glug of olive oil and balsamic vinegar, top with the oregano and some sprigs of rosemary. Place the sausages on top and stir to coat it all in the seasoning, then place the sausages back on the top. Bake at Gas Mark 5 for 30 minutes, then turn the sausages and bake for another 15-30 minutes depending how well done you like your sausages. Remove the sausages and keep warm. Place the baking tray on the hob and gently simmer the sauce, squish some of the tomatoes and reduce it down a little. 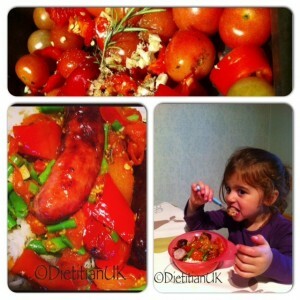 Serve potates/rice/pasta/polenta topped with the tomatoes, with 2 sausages per person on top. 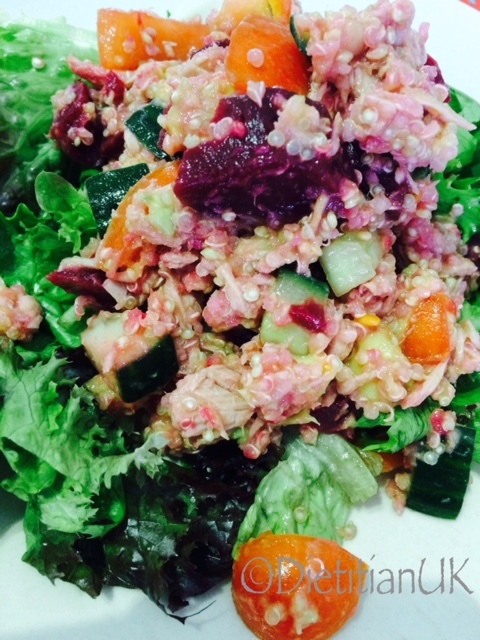 Add a green salad for extra vegetables, colour and crunch.